If you’re currently in the job market and have a CV with a nice collection of work experience, then you’ve probably already listed all the daily tasks and responsibilities that go with the job title. Surely this is all the employer needs to see how awesome you are, right? Unfortunately this just isn’t going to cut it, and the employer expects a much more in depth review of your employment history. They want to know how you performed in those roles, so they can see what your potential is and how that commitment may transfer over to their company. An employer will have to read through lots of CVs to try and short list the best candidates for an interview. With such a huge amount of applications they will easily be able to find plenty of CVs that tick all the right boxes, which means the only way to narrow that search down even more is to evaluate the performance. So how to your demonstrate your performance on a CV? The problem with this is that the employer will find it hard to believe that this is true – and why should they? They haven’t met you before and have no idea of how you perform in the workplace. So to be believable on your CV you need to provide examples and evidence of your performance. Let’s say for example that you are applying for a customer service position; this will mean that you need to demonstrate your problem solving, communication, and customer service skills (to name a few). By merely stating that you have those skills will decrease your chances of getting an interview, and instead you should provide examples of when you used those skills. Think back over your work history and select some examples of when you provided exceptional customer service. Put these examples down on your CV, and don’t be afraid to go into a little detail about what happened and what you did. The hiring manager will take great pleasure in reading about specific examples from your work history, and it will make a nice change from reading just the tasks like lots of other CVs they’ll receive. In some instances it may be better for you to use actual numbers and stats on your CV, to provide a better understanding of your achievements and performance. This would work great for a sales role for example, and would give you a platform to show off your sales skills. If you stated that you were the top salesman of the month three times in a row, then great! However, you could instead also provide the amount of units you sold and the revenue you made. That small addition will mean the world of difference, and will give you a much better chance of getting an interview. 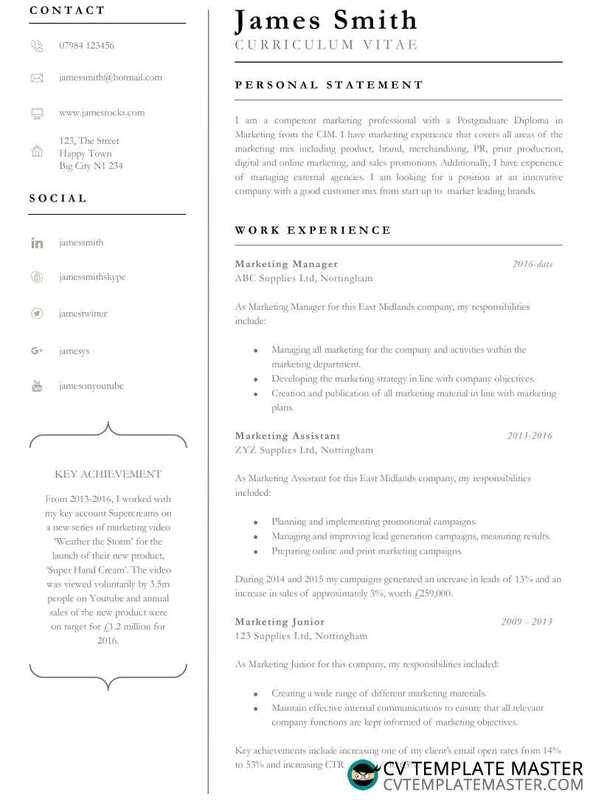 In the above example a feature box is used to the left of the CV template to highlight a key achievement. Source: Achiever Professional CV template. You should always tailor your CV to the role to make the hiring manager’s job much easier. Rather than hiding all the important skills within your CV, you should write a relevant CV that clearly identifies all the key points the employer is looking for. When it comes to providing examples of your performance, a well tailored CV will look to address those areas too. There is no point in providing stats and examples of your performance for areas that bear no relevance to the role or industry you are applying for – with the exception of when you don’t have any relevant work history and want to still demonstrate your performance. Pick out the outstanding achievements and clear indications of exceptional performance, but ensure it’s tailored to suit the employer. What would they want to see on your CV? What can you bring to the role with your skills and experience? Answer these questions clearly and precisely on your CV, and you’ll stand a far greater chance of getting an interview.